The unit circle is used as a way to help you evaluate the sin and cos at frequently used angles. It accounts for both degree and radian measure. For more information about the 6 trigonometric functions, please visit our trigonomtry main page. The circle has many connections to something you are very familiar with: the pythagorean theorem. But the only way to truly know the circle is to practice filling it in. GradeA offers both completed circles as well as blank ones that you can use to practice. Your teacher will be so impressed with you! GradeA is excited to present you with our interactive circle. It allows you to enter values for radians, degrees, and the coordinates, and then checks your results. Its the perfect way to learn all the values! How do I use this circle? Each grey line represents a commonly used angle in trigonometry. The inside angles are represented in radian measure. The next circle represents degree measure (which are clearly labeled with °). The coordinates on the outside of the circle represent the cos and sin of each angle. The x-coordinate represents the cos, and the y-coordinate represents the sin value. Example: Look at the 30° angle in the first quadrant. Can you correctly fill in the entire circle? Practice makes perfect, and the sooner your know the circle, the better you will be at trigonometry. 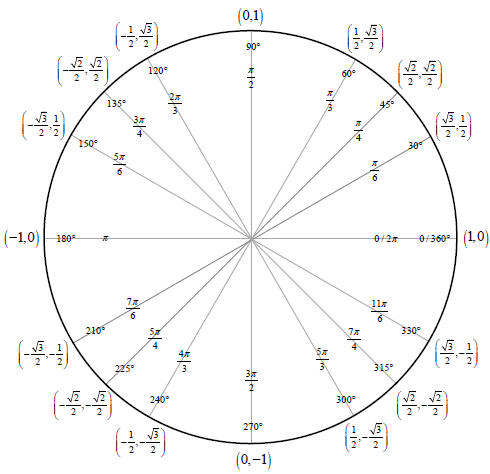 In case you missed it above, you can download a full-sized unit circle absolutely free! 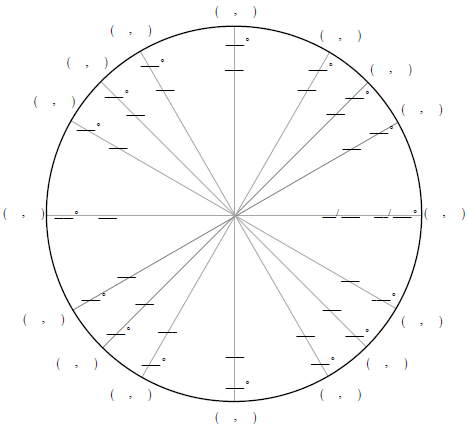 You can also download a full-sized blank circle to practice. Now that is GradeA! Return to the trigonometry main page or the GradeA homepage for other free math help resources.